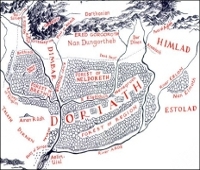 Location: The fords where the South Road from the Pass of Sirion to Nargothrond crosses the River Teiglin at the western edge of the Forest of Brethil, just north of Cabed-en-Aras (later called Cabed Naeramarth). 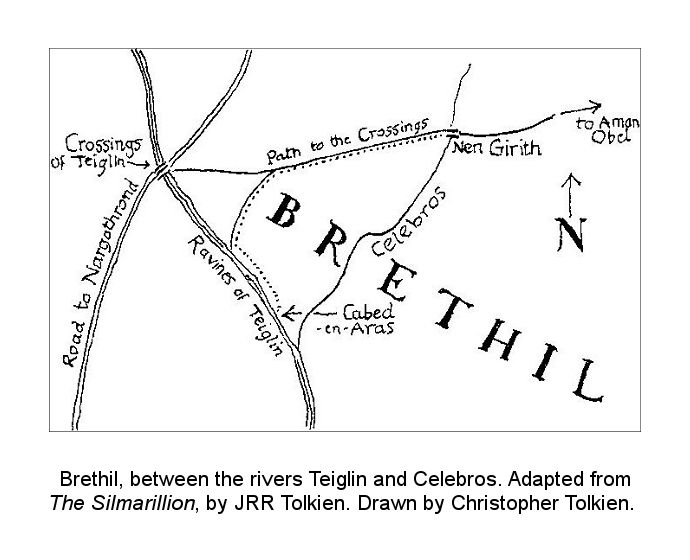 Brethil and its environs, showing the Crossings of Teiglin. Orcs in greater numbers than before came down from the North and along the old South Road over Teiglin, troubling all the woods on the west borders of Doriath. Detail of the Crossings of Teiglin. [Húrin]... went back to the Brithiach; and passing [south] along the eaves of Brethil he came at a time of night to the Crossings of Teiglin. The night-sentinels saw him, but... Húrin was not stayed, and he came at last to the place of the burning of Glaurung, and saw the tall stone standing near the brink of Cabed Naeramarth. 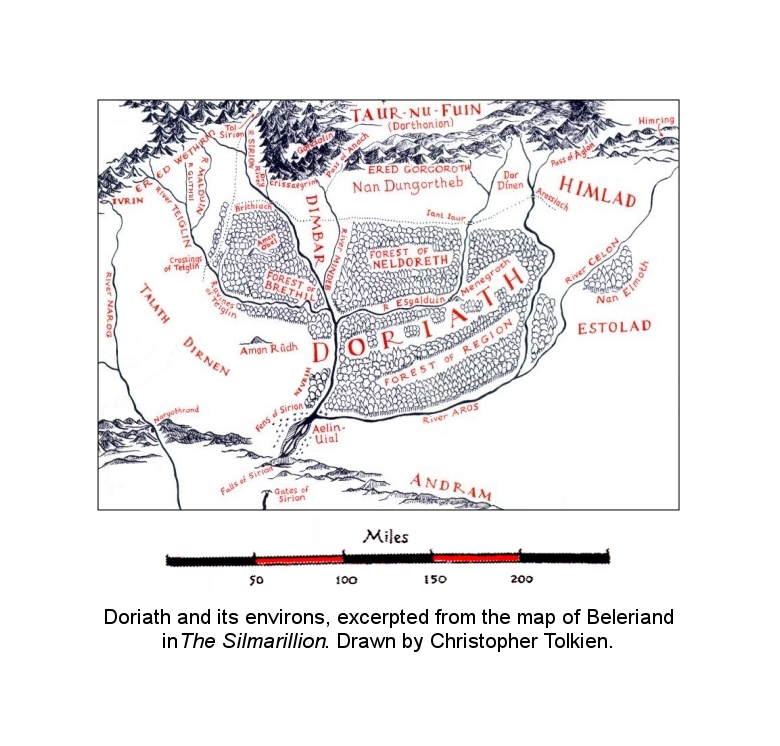 Brethil was claimed as part of his realm by King Thingol..., and he would have denied it to Haleth; but Felagund... obtained this grace for her: that she should dwell free in Brethil, upon the condition only that her people should guard the Crossings of Teiglin against all enemies of the Eldar, and allow no Orcs to enter their woods. [The] Men of Brethil had waylaid at the Crossings of Teiglin the Orc-host that led the captives of Nargothrond...; but the Orcs had at once cruelly slain their prisoners.... [They] had laid [Finduilas] in a mound near that place, and named it Haudh-en-Elleth, the Mound of the Elf-maid. [The Drúedain] made... images of themselves and placed them at the entrances to tracks or at turnings of woodland paths. These they called "watch-stones;" of which the most notable were set near the Crossings of Teiglin, each representing a Drúadan, larger than the life, squatting heavily upon a dead Orc.